A Primer in Wing Planforms. How the FireBolt was designed. Wing plan forms come in many shapes. The most common is the Rectangular. This shape is defined with a leading and trailing edge as parallel. In ram-air parachute design it only requires 5 patterns. A top skin, a bottom skin, a load rib, a non-load rib and a stabilizer. These are repeated as necessary to generate the required number of cells. The next step in the evolution of the ram-air was the tapered tip. On a 9 cell the inboard 5 cells were rectangular and the tips were tapered to a shorter cord aligned at the quarter cord. This increased the pattern complexity only by 2 more cells and an additional top and bottom skin. This plan form is in common use today, some manufacturers call it an elliptical or semi-elliptical or tapered canopy. It is a tapered tip by definition. A true elliptical plan form is based upon a geometric ellipse. The ellipse used for the FireBolt began as a 3 to 1 geometric ellipse. This ellipse was then truncated to a 2.65 to1 by removing a portion of the wing tips. The next step was to divide the plan form into cells. This plan form and cell division represent the actual ellipse used on the FireBolt design. It was and is, however, difficult to balance and trim. 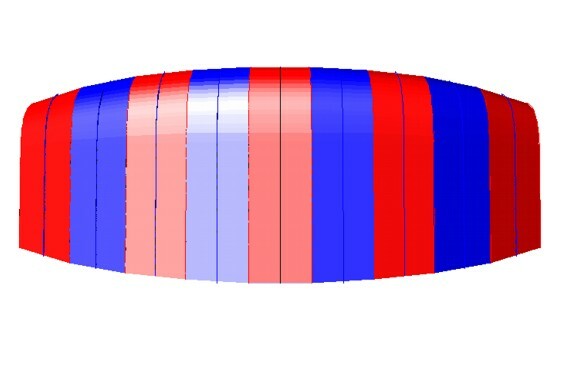 The true ellipse has a lift and load distribution which is symmetrical across the canopy. This form provides maximum lift for the available square footage. Additionally, the stall is also symmetrical across the canopy allowing for greater lift for a longer time at low speeds. While the FireBolt plan form is new to Ram Air parachutes it is not new to aeronautics. It has long since been known that the fully elliptical wing is the most efficient. While there have been previous attempts to utilize this most desirable of wing forms they have resulted in compromise because of design stumbling blocks. This new technology is accomplished though the use of 3D modeling in a CAD system. It is not so much as what we did but how we did it. How we approached the design task. It took over two years and hundreds of test jumps to achieve all of the goals set out in the design challenge. This is an actual CAD screen shot of the rendered wire frame of a FireBolt viewed from the top. The perimeter of this view is the inflated plan form from which the square footage is derived. To solve the difficulties in the design of the true ellipse designers would then compromise this configuration to a semi-ellipse. This is accomplished by re-aligning the ribs along the quarter cord. Notice the similarity between this and the tapered tip design. Notice how the leading edge is more nearly straight than the trailing edge and that the trailing edge has a considerable loss of tail surface.